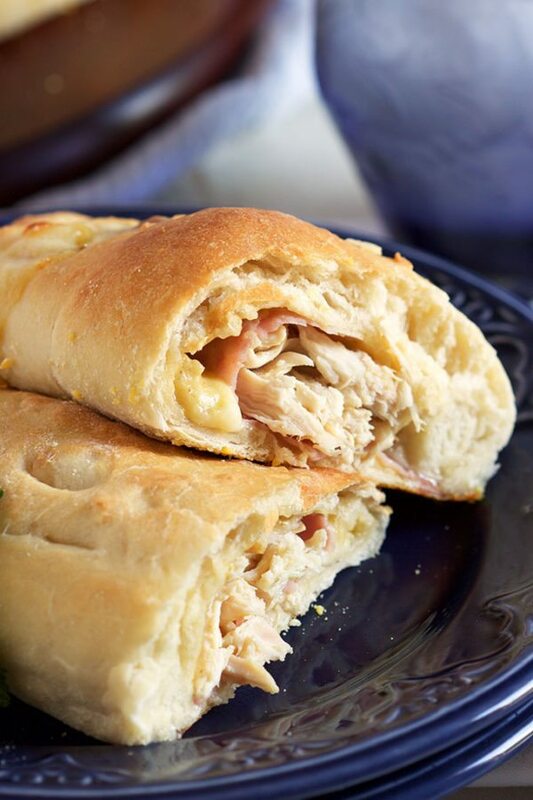 I’m super excited to share one of my favorite things in the whole world….the calzone! I’m a huge carbolic so anytime you wrap anything up in dough and bake it….I’m there. 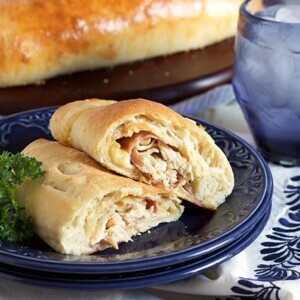 And these easy to make Chicken Cordon Bleu Calzones will not disappoint. Anyone….anywhere. 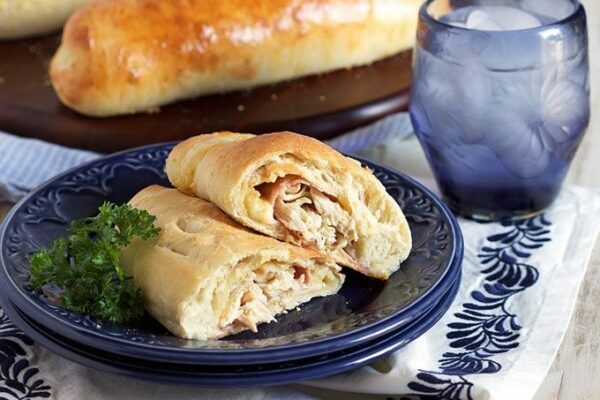 If you’re not familiar with Chicken Cordon Bleu, it’s basically a chicken breast stuffed with ham and swiss before being baked and devoured. I just went one step further and stuffed it into my homemade pizza dough stromboli style making it absolutely perfect for game day. You can even freeze them after assembly for an easy weeknight dinner. Leftover chicken from your Sunday dinner or a rotisserie chicken make this even quicker to throw together. 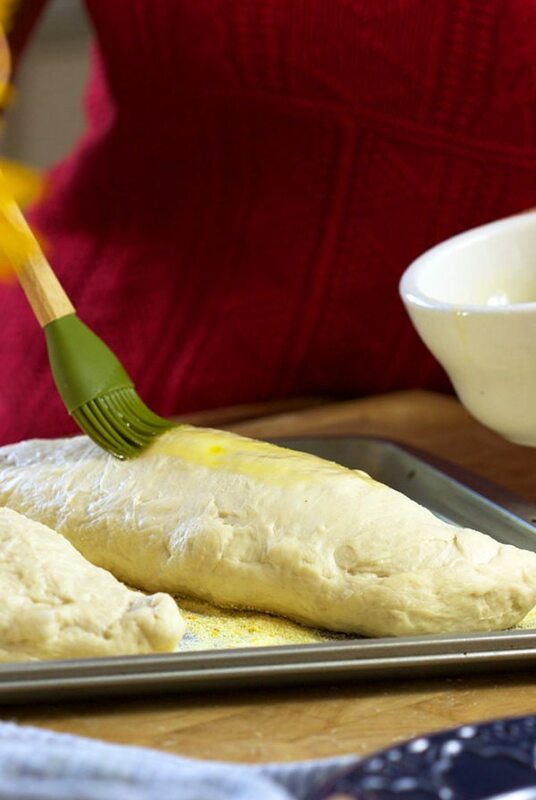 Brush the dough with a bit of dijon mustard leaving a 1 inch border around the edges. If you spread too much mustard and cover the whole surface, the dough won’t seal and the filling will leak all over the place. 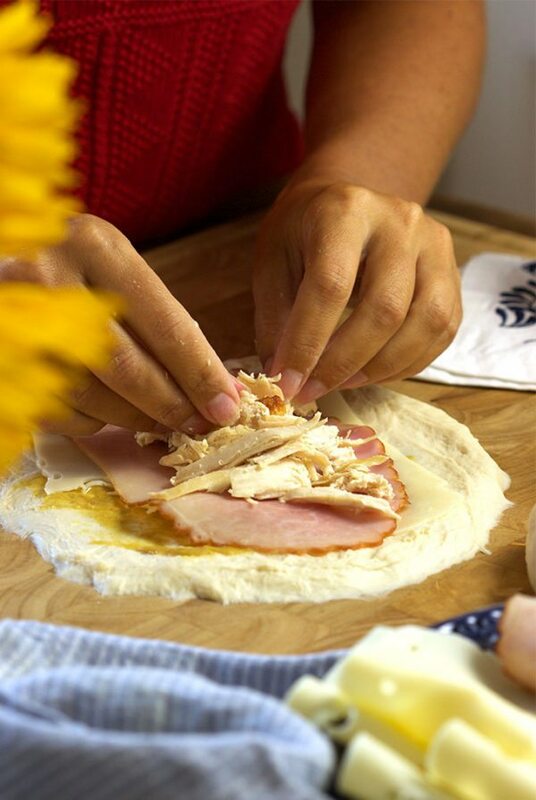 Layer your cheese, ham and shredded chicken over the dough….leaving that one inch border around the edge of the dough. 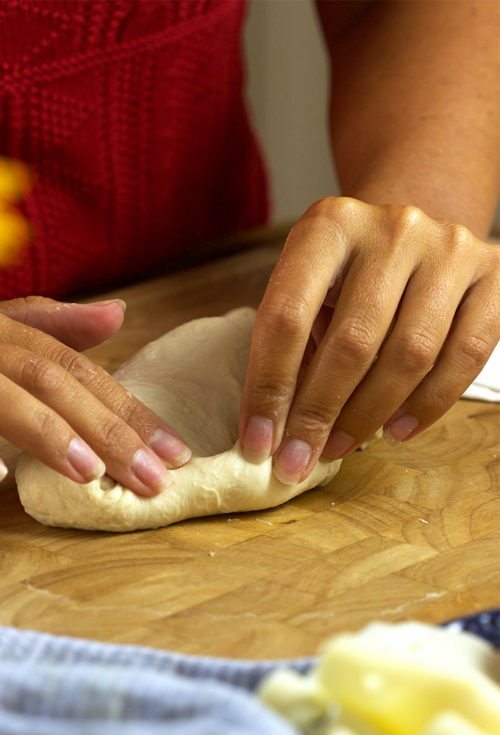 Fold the dough over to create a half moon and seal the edges by pinching them together with your fingers. You can also use a fork to press the dough together. Place the calzones on a baking sheet dusted with cornmeal, the cornmeal prevents sticking and gives the dough a crisp texture. Brush the surface of your calzones with lightly beaten egg before baking in a 425 degree oven for 12-15 minutes. 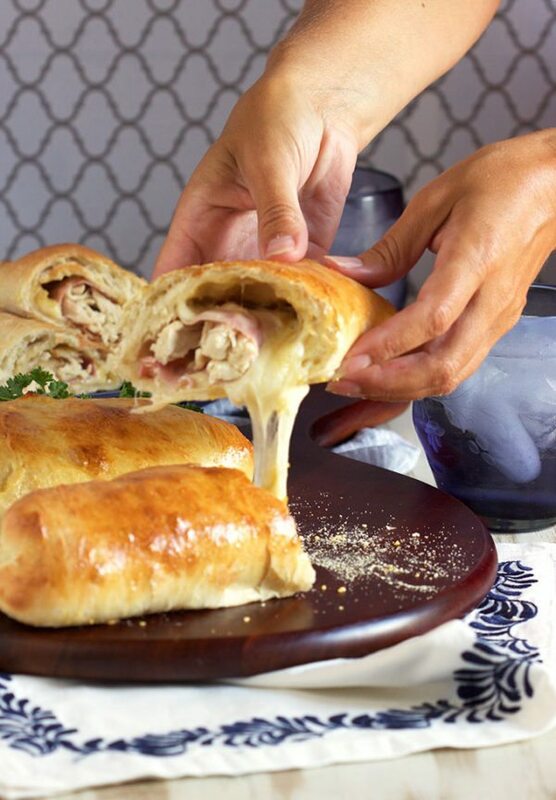 This recipe for Chicken Cordon Bleu Calzones makes 4 big, beefy calzones that could easily serve two people. Unless they have a hearty appetite. Cut them in half before serving and watch that melty cheese ooze out. Serve with a light salad and devour. 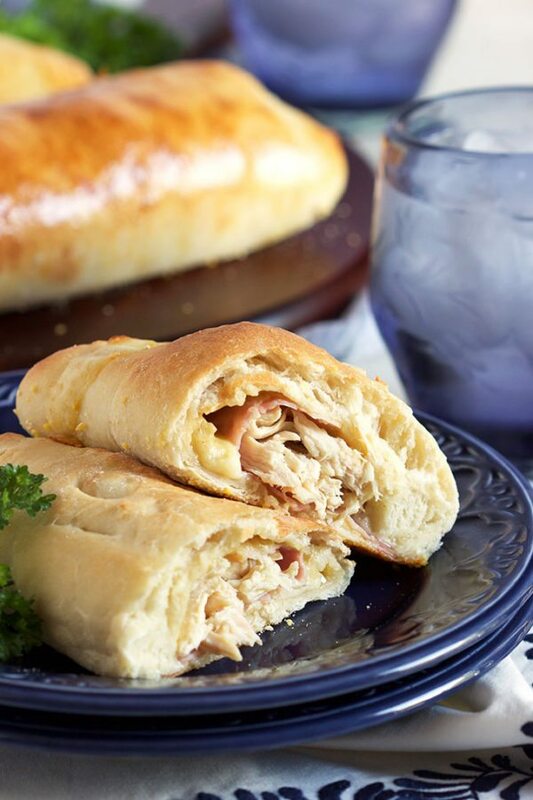 Easy Chicken Cordon Bleu Calzones are stuffed with swiss cheese, ham and chicken for the ultimate comfort food. Perfect for weeknight dinners and game day parties. Divide the dough into four equal pieces. Roll or stretch the dough into a 6 to 8 inch oval. 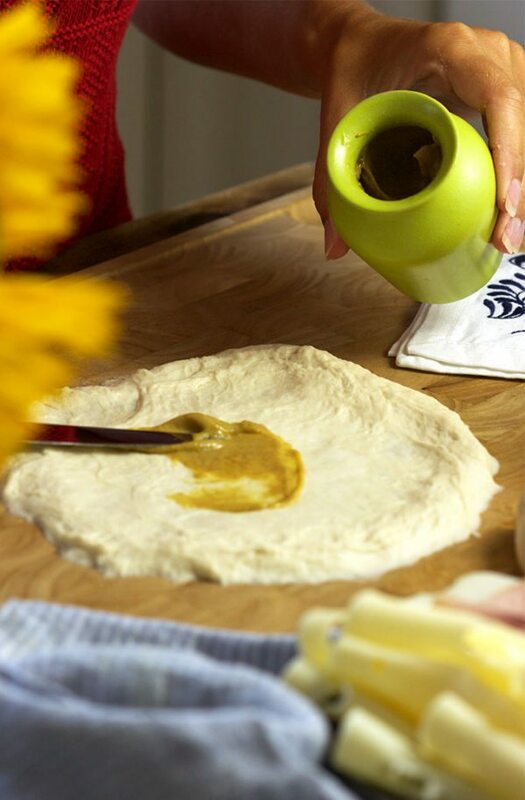 Brush the surface of the dough with the Dijon mustard-- leaving a 1-inch border around the edges. Layer two slices of cheese, two slices of ham and 1/2 cup shredded chicken on the dough leaving a 1 inch border around the edges. Fold the dough over the chicken and press the edges together to seal. Pinch tightly to avoid the cheese leaking out during baking. Repeat with the remaining dough and other ingredients. 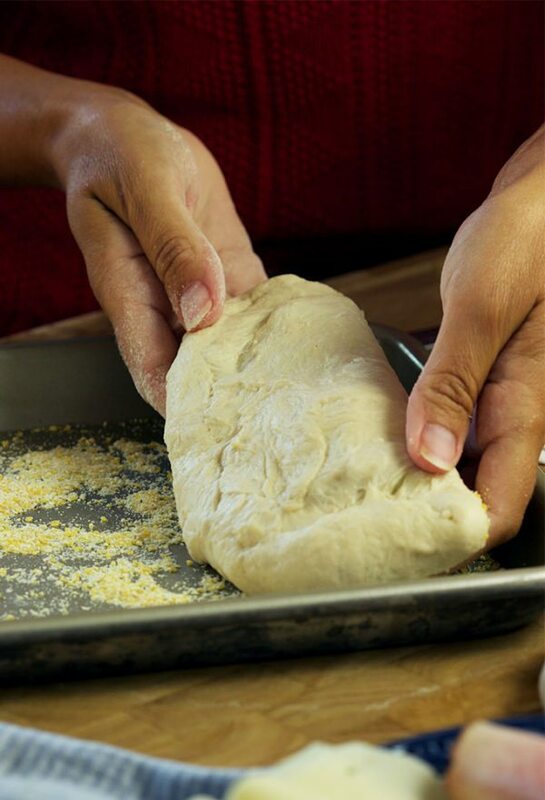 Place the calzones on a baking sheet dusted with cornmeal. Brush the surface of the calzones with the egg. To freeze: Assemble the calzones as instructed (up to line 5) and place on a clean baking sheet. Freeze for 4 hours and then wrap individually in plastic wrap. Wrap again in foil and store in the freezer for up to 2 months.